A standard Field Artillery battery consisted, at full strength, of six guns. Each gun was attached to a limber pulled by six horses, and was supported by a caission, also attached to a limber pulled by six horses. The caisson carried two ammunition chests (also a spare wheel), and there was one chest on each limber for a total of about 1,200 rounds for the battery. There was also a battery wagon, a forge wagon and an ambulance, for a total of 18 vehicles. A battery had five officers; one captain commanding, one first lieutenant in charge of each of the three sections, and one second lieutenant in charge of the line of caissons. Caissons and limbers are treated differently, the caissons are held in reserve and move seperately behind the battery. A limber is attached to each gun and holds some ammunition plus the necessary equipments for the service of the piece. The battery also had one quartermaster sergeant, who issued clothing, equipment, and rations and one first sergeant, who was the battery orderly sergeant and the senior NCO. A section consisted of two guns and their crews, and were referred to as "left", "center" and "right". Originally designed to be packed on draft animals and set up in places where larger field pieces could not be, the versatility of the mountain howitzer kept it in use by the Army until the late 1890's. The bronze barrel weighed 220 lbs. and was carried by one animal, the wheels, axle, and trail by another, and six ammunition boxes were carried by three others. Two guns were a section and four to six guns made up a battery. The bore diameter was 4.62" and the guns fired the same assortment of spherical twelve lb. shot and shell that their larger cousins did. The exception being that the canister shot for the mountain howitzer contained 158 .68 caliber lead shot as opposed to 48 1" iron shot for the 12 lb. Field Howitzer and the 12 lb. Napoleon. The effective range for the guns was 900 yards but they were capable of firing 1400 yards at maximum elevation. In actual practice they were used to support infantry and cavalry most often so long range was not a factor. There were three variants of the type, those being the original pack carriage and the prairie carriage no's 1 and 2. The prairie carriages were designed to be hauled behind a single animal or when equipped with similarly sized prairie limber, they drawn by a team of two. The prairie carriages differed from the standard pack carriage in that they had a wider wheel spacing and larger diameter wheels to facilitate being hauled behind the animals, thus making it easier to bring them into play. #7 carried the round to #5. When in action, the gun would be driven into position, the gun would be removed from the limber by the cannoneers and brought to bear on the target. If need be, the #1 man would use the 'worm' to remove any material from the bore and swab it with a damp sponge rammer (worming is a modern, mandatory safety step, universally required by all reenacting units). The gunner would decide the range, and tell #6 at the limber, along with the type of round required. Then the gunner would mount the sight, and begin to aim the gun. #6 would prepare the round, using the Firing Table in the Limber Box to choose fuse time. #7 would carry the round to the #5 man who delivered it to the #2 man standing by the muzzle of the gun. He would position it in the muzzle of the gun for the #1 man to ram down the bore. All this time, the #3 man has covered the vent to keep air from any embers that may be present. When the round is seated, the #3 man would use a pick (the priming wire) to pierce the powder bag. #1 and 2 at the wheels of the gun and #3 at the trail spike would assist the gunner by moving the gun left or right. After the gunner is satisfied with his job, he removes the rear sight and steps back from the gun. The #4 man inserts a primer into the vent, attached to the lanyard, and steps back, #3 helping keeping the lanyard taut. At this time, with the cannoneers safely away from the gun, it is ready to fire. 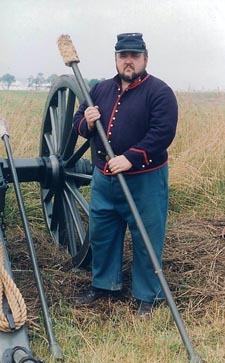 Upon command of the Chief of the piece, #4 pulls the lanyard firing the cannon. #1,2 and 3 move it back into battery (correct position), and the cycle starts again.